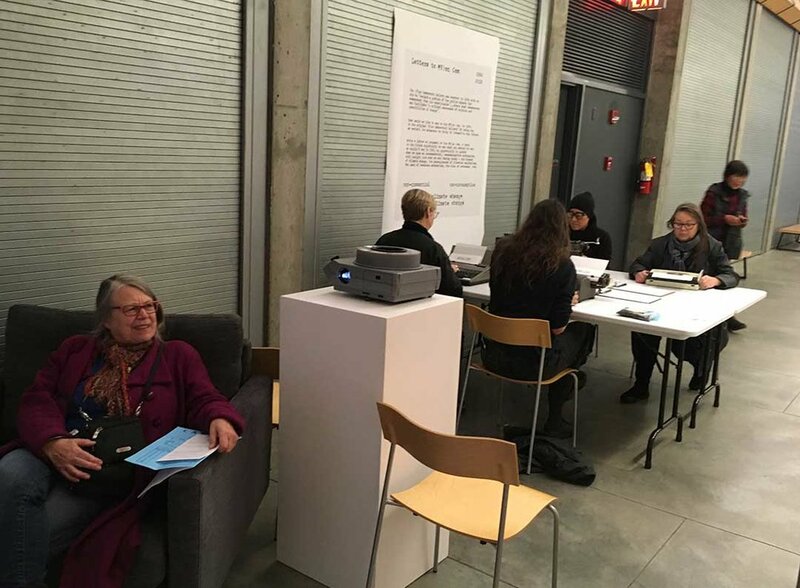 On Saturday November 3rd, 2018, from 1pm to 2.30pm, with my colleagues Elizabeth MacKenzie and Cindy Mochizuki, I partook in Archives Week at the Belkin Art Gallery at UBC. My presentation Letters To (N)on Com, included working with typewriters, projecting photographic slides, inspired by the fonds of the (N)on Commercial Gallery that live in the Belkin Art Gallery Archives, and where public participation engaged playful letter writing back to the future. 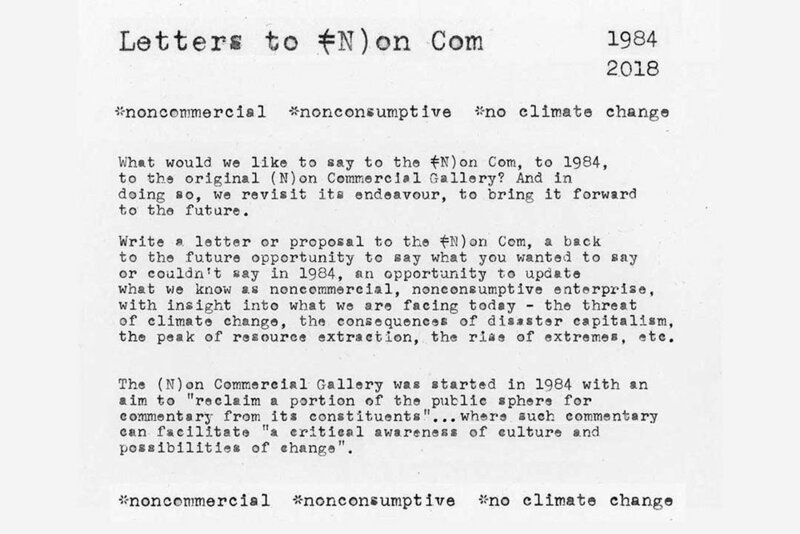 Thanks to Carol J Williams and Don Gill for correspondences about the (N)on Com, along with Kati Campbell and Warren Murfitt for starting the gallery at 1011 Commercial Drive in 1984. Additional appreciations to staff at the Belkin for their invaluable help preparing and setting up — Owen Sopotiuk, Naomi Sawada, Christine D'Onofrio, David Steele, Anna Tidlund, Erin Watkins, Shaunna Moore, Karen Zalamea, and Makiko Hamaguchi. As part of Independent Archives Week, we ask the question, how do we respond to archives both public and private? 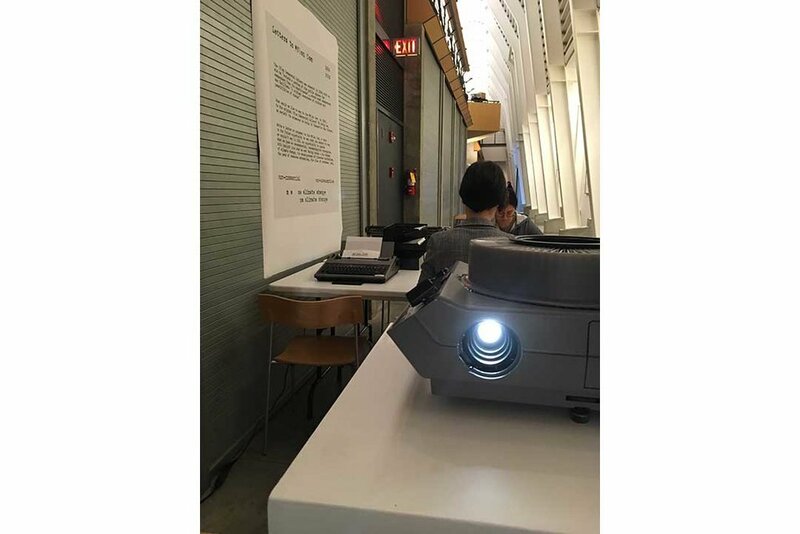 In this come-and-go event, artists Laiwan, Elizabeth MacKenzie and Cindy Mochizuki contribute three individual responses to the Belkin Gallery Archives and in relation to artist Christine D’Onofrio’s online project, Intuition Commons. The responses are open for viewing, listening and conversations throughout the event. Light refreshments will be served. Intuition Commons is a growing, interactive database of female influences that destabilizes the bias to individualism in art. Projected in a gallery installation, contributors nominate their influencers with visual connections, overlapping stories, keywords, and links, creating a rhizomatic archive. It is part of the exhibition Beginning with the Seventies: Collective Acts (September 4-December 2, 2018) curated by Lorna Brown. 221A, grunt gallery, The Morris and Helen Belkin Art Gallery, Rungh Magazine, VIVO Media Arts Centre, Western Front, & Artspeak present Recollective: Vancouver Independent Archives Week from November 2 – 13, 2018. Recollective: Vancouver Independent Archives Week 2018 is a series of free public events, panels, conversations, and screenings that highlight artist-run centre archives, artists working with archives, and the intersections between contemporary art practices and social movements in Vancouver.